Christopher Hallum, regional manager UK & Ireland, UE Systems, discusses the role of ultrasound in condition monitoring. Vibration analysis has long been the instrument of choice to monitor bearings and other rotating equipment. 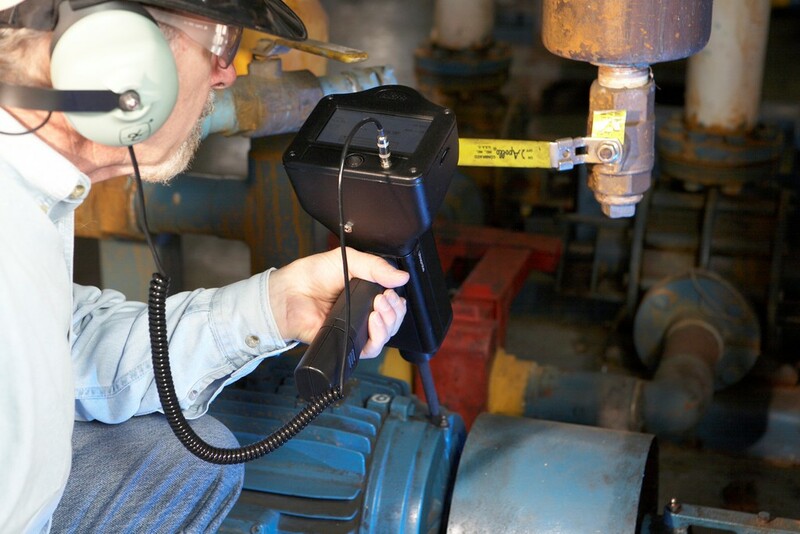 More commonly, ultrasound is being used in conjunction with vibration analysis to help technicians confirm the condition of mechanical assets. Because of the versatility of ultrasound, if a facility does not have a robust vibration analysis program in place, ultrasound can be implemented to detect early stage bearing failures, as well as other issues. 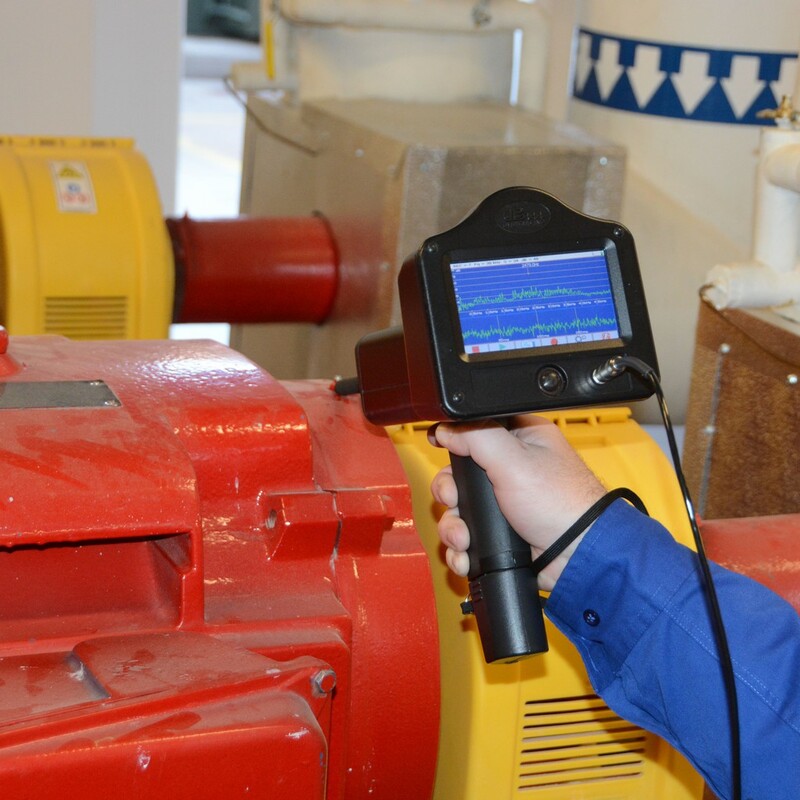 If the vibration analysis is performed by an outside service provider on a quarterly or monthly basis, ultrasound can be used during the interim. This will help the facility to know the condition of some of the more critical assets prior to the service provider entering the facility; therefore, the service provider’s time can be used more efficiently because the plant knows if there are any eminent problems with the assets that are being monitored by ultrasound. Another scenario in which ultrasound may be used first over vibration analysis is with the monitoring of slow speed bearings. Slow speed bearing monitoring with ultrasound is actually easier than you might think. Because most high end ultrasound instruments have a wide sensitivity range and frequency tuning, it is possible to listen to the acoustic quality of the bearing, especially at slower speeds. In extreme slow speed bearing applications (usually less than 25rpm), the bearing will produce little to no ultrasonic noise. 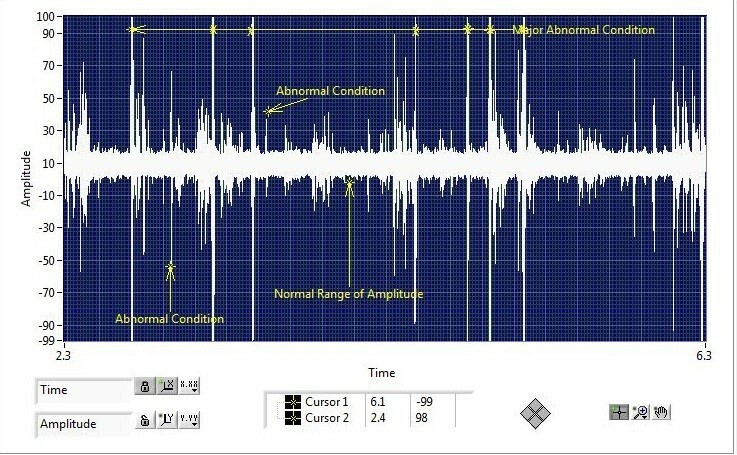 In that case, it is important to not only listen to the sound of the bearing, but more importantly to analyze the recorded ultrasound sound file in a spectrum analysis software, focusing on the time wave form to see if there are any anomalies present. If “crackling” or “popping” sounds are present, then there is some indication of a deformity occurring. In bearing speeds above 25rpm, it is possible to set a baseline decibel level and trend the associated decibel level readings over time. To get the most out of an ultrasound bearing condition monitoring program, it is best to establish routes for data collection. Through this effort, maintenance technicians can set baselines and bearing condition alarm levels. This approach is called the Historical Method. Using this method, the inspector first establishes a route in the ultrasound software of the points where the data will be collected. Once the route is created, the inspector loads the route into the ultrasound instrument. While collecting the initial data to build the history, the technician should record both the decibel level readings and the sound file recordings. It may also be necessary to collect the readings more frequently than necessary to establish the history until the baseline and alarm levels are set. Once the baseline has been established, alarm levels can be set. For most bearings, an increase of 8dB above baseline represents a lack of lubrication for that bearing. An increase of 16dB above baseline means the bearing is in a failure mode this is beyond just a lack of lubrication. For slow speed bearings, these alarm levels may need to be adjusted since slow speed bearings do not produce as much high frequency sound as bearings that are rotating at faster speeds. The alarm levels for slow speed bearings should be set according to what the initial historical decibel level trend shows. Once the baselines and alarm levels have been set, it is only necessary to record the data or dB readings. From that point forward, a sound file recording is only taken once the point has reached either the low alarm, or the high alarm. 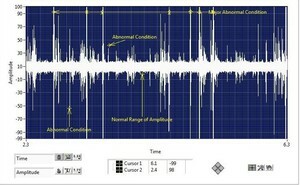 The alarm level sound file recording can then be compared to the original baseline sound file. This is important in diagnosing what the current bearing condition is. In a spectrum analysis software, technicians may also be able to compare the baseline sound file FFT to either the current sound file, or compare up to as many as four identical points on four identical machines. Airborne and structure-borne ultrasound instrumentation has become a must-have technology for any maintenance and reliability program. Due to its enhanced sensitivity and ability to detect slight changes in the amount of high frequency sound produced by rotating equipment, ultrasound is ideally suited to detect early stage bearing fatigue, even in slow speed bearings. 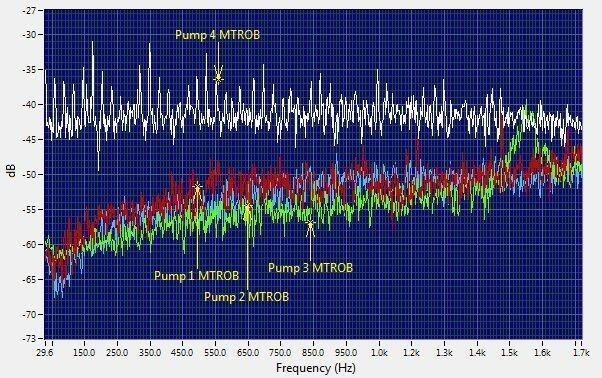 By translating the high frequency sound into the low frequency or audible range, these instruments allow the users to hear, see, and diagnose bearing faults.